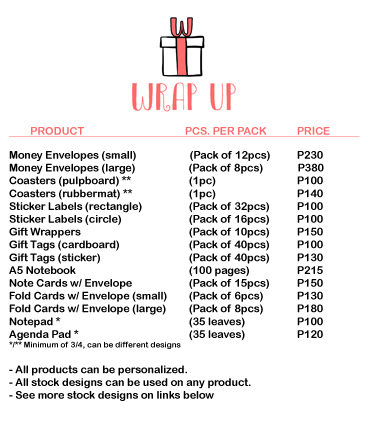 Wrap Up - Check designs and place order here! - Include in the message upon order checkout the following: design, qty per design, customized text per design, and email address. - For orders that require additional layout, choose LayoutFee variant for the layout fee charge per design. Check the 'Stock Designs' links on the header of this order form for the corresponding design codes.